Photographer(s) Appreciation: Thank you to Priscilla Burcher@Flickr for this image of Musa coccinea grown in Colombia (shared via the Botany Photo of the Day Flickr Pool). Scarlet banana is cultivated in tropical climates around the world, including Colombia (where this photo was taken). Its native range, however, is restricted to southeastern China and Vietnam. Of note, it is now extinct in the wild in Guangdong. 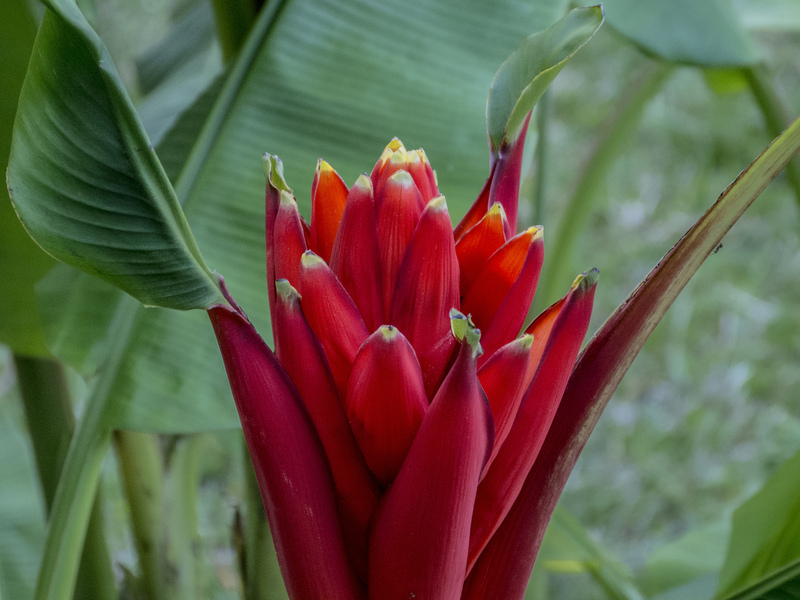 Musa coccinea is also refered to as red-flowering banana or red torch banana. The species was described, and scientific name published, by English botanist Henry Charles Andrews in 1799. Scarlet banana is in the same family as other bananas and plantains. While its fruit is edible to humans, it has not achieved widespread cultivation for such use (perhaps it is not as rich in sugars or starches?). Other animals make use of it, though. For example, scarlet banana is pollinated by bats. Bat pollination, or chiropterophily, occurs in only 67 plant families (out of ~450 families). Musa coccinea is an evergreen perennial species that produces vibrant ornamental flowers. In summertime, cylindrical yellow flowers appear, nestled within the bright red bracts. There are approximately six floral bracts in each column, with female flowers hidden by the lower bracts and male flowers hidden among the topmost. A monocot, the plants do not produce true wood; instead they form non-waxy pseudostems, reaching a height of 1-2m (3-6ft.) high. The rounded leaves are green, growing approximately 1m in length and 25cm (10 in.) across. Scarlet bananas are suckering plants, with numerous root sprouts growing near the base of the mother plant. The fruits of scarlet banana are orange when ripe and oblong in shape, perhaps 5cm (2 in.) long by 2.25 cm across. In a study done in 2011, the anthocyanidins pelargonidin and cyanidin were discovered within Musa coccinea (PDF), indicating potential use as a natural food colouring. Perhaps, like some other banana species occasionally encountered in South Florida, the fruit of Musa coccinea are filled with so many seeds that they are almost inedible. Beautiful photo and informative description. “The fruits of scarlet banana are orange when ripe…” Does this mean the skin, the pulp, or both? Very interesting and a well-written article. Any idea why it is extinct in certain areas of China? In Chinese it is known as 红蕉 hong jiao, which means “red banana”. This is one of three bananas named for being red and found in China, the others being Musa rubra (red banana) and Musa sanguinea (bloody banana). Although the botanist may just have been upset with the last one. The plant was named in 1790 as Musa uranoscopus by Loureiro. This specific name means “heaven-gazer” and was used in both Greek and Latin for a type of electricity-producing fish with eyes pointed upwards. The banana was so-called because the flower-stalk did not droop like many in the genus, I presume. He records the fruit as being scarlet, many-seeded and not edible. Musa uranoscopos, sorry, the fish is the genus Uranoscopus. Nathalie had originally written it as being inedible, but the last link in the entry (which I now see is only available to subscribers / in some libraries) has a factsheet which states it is eaten by rural indigenous peoples in Vietnam. The inaccessible one given above is found in part at https://books.google.co.uk/books?isbn=9400725345 . Fruit and plant eaten according to this paper used as a reference by that book. Banana flower buds are commonly eaten in Vietnam. The local name they give as “chuoi rung” is the common Vietnamese term for “wild or jungle banana” of which there are many species including Musa coccinea. The study seems to have been done mainly by enquiring of the locals but the authors do say they collected over 300 voucher specimens while accompanying collectors. Would this banana work as a container plant in the Southern U.S.?